Microwave the potatoes for just three minutes, then dice them. 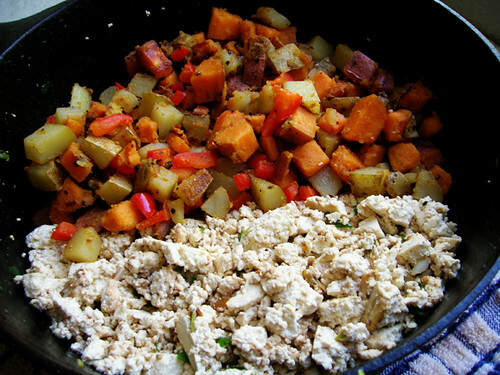 Heat oil in a saute pan over medium-high heat, then add the potatoes, onion, and any other vegetable to the pan. Toss to coat potatoes in oil, then cover and cook for 10-15 minutes. Uncover and toss again, and cook for another 10-15 minutes until browned. Set the hash aside and use the same pan for the tofu. Heat oil in the pan over medium heat. Add the onions and saute lightly for 1-2 minutes. Stir in soy sauce. Put the hash back in the pan like in the picture, and let it all heat back up for about five minutes before serving.